I have read and enjoyed another Carl Trueman book. As a professor at Westminster, Trueman is a Reformed theologian and historian. However, almost all the books I’ve read by him are directed more at cultural issues and only slightly affected by his theology. In this book are two sections examining two Reformed theologians, J. Gresham Machen and Benjamin Warfield, both of which make good reading. 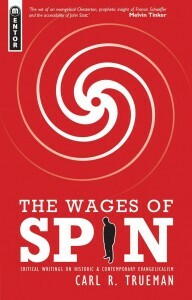 The rest of the book is given to the “spin” going on in contemporary worship. In this Trueman speaks with his usual candor and insight. Here are a few quotations from these sections.